Fact-filled article by William Bryant, well-known GMC historian. Repurposed articles published by Family Motor Coaching, the FMCA magazine, are available below. 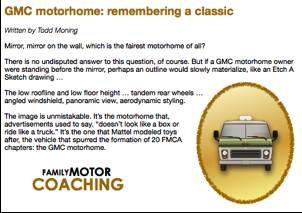 Bill Bryant, GMC motorome historian, authored a three-part article on the history of the GMC motorhome for Family Motor Coach Association’s monthly publication, Family Motor Coaching. This series is probably the finest produced on the history of the classic design that was copied but never completely emulated. Enthusiasts may view/download the reprint from the 2004 issues. 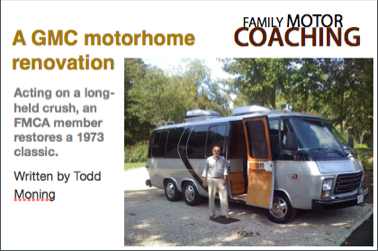 Bill’s interest in GMC motorhomes began in 1984 when he purchased his first GMC Motorhome, a 1976 Palm Beach, which he still drives to this day. He also owned a 1976 GMC Birchaven. His inquiries into “TZE history” began when he started collecting everything in print that dealt he could get his hands on. He had the good fortune of being able to contact and interview a number of GMC engineers who were responsible for the development of the vehicle and now has 32 cassette tapes filled with interviews. His collection of GMC Motorhome memorabilia includes 50 different sales brochures, 14 dealer sales films, 60 different magazine advertisements, 50 different models sold as HotWheels by Mattel, three different Barbie GMCs, Hess Training Vans, playing cards, Frisbees, belt buckles, clothing, ballpoint pens, flyswatters, and much more. The GMC community owes a debt of gratitude to Bill for giving us this story of a timeless design concept that is still providing substantial use to happy owners today. The article (referenced in the image above), was submitted to Family Motor Coaching and published in the November 2012 issue. 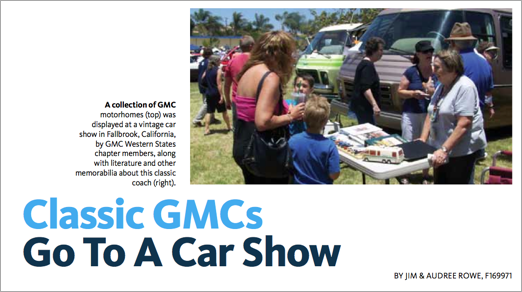 Jim and Audree Rowe are members of GMC Western States and accepted the challenge of entering the GMCs in a vintage car show in Fallbrook, California. Not only were the GMCs on display but also some literature and other memorabilia on the GMC. View/download the PDF reprint of this interesting article which is being hosted at gmcws.org with permission from FMCA. In 2008 the GMC community celebrated the fact that it had been 30 years since the last GMC unit with a VIN starting with TZE rolled off the production line at GM’s plant in Michigan. In celebration of this achievement, Jim and Audree Rowe compiled a story for Family Motor Coaching. The article was published in the issue of October 2008. View/download a reprint of this great, well-written article containing several photos of GMCs that have been kept in good running order since they’re “still cruising after all these years”. After six years of ocean voyages, Daniel Prigmore decided to look for a land vessel so he could explore the coasts and interior of the United States in more detail. 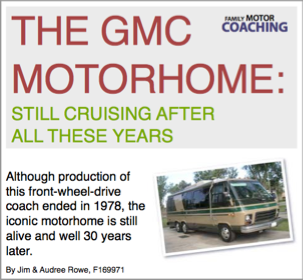 The only motorhome that truly mattered to Daniel Prigmore was the one made by General Motors Corp.
View/download a reprint of this article containing several photos of the 23-foot motorhome. The low roofline and low floor height … tandem rear wheels … angled windshield, panoramic view, aerodynamic styling. View/download a reprint of this article with images not contained in the original article.